The midfielder was signed from Queens Park Rangers on 24 January 2002, initially on a month’s loan – a deal which was subsequently extended by two months before signing a permanent deal just prior to the playoff semi-final at Rochdale. Stuart had started his career in non-league football with Saffron Walden Town and Bishops Stortford combining football with working for a removals firm. 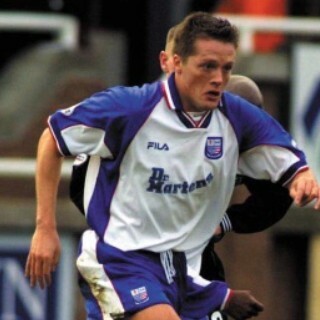 He was ‘discovered’ in July 1999, signing for the London club in July 1999 for a £15,000 transfer fee. He played some 95 games for QPR (scoring 17 times) before his move to Nene Park, and made his debut in the 1-5 defeat at Hartlepool. Three days later, the defeat was forgotten as he scored in his home debut against Macclesfield Town, and vital goals against Leyton Orient and Torquay United saw Diamonds into the play-offs, where he also scored in the home leg against Rochdale. The playmaker helped Diamonds to win the Division 3 title the following season, although he missed the final few games of that season after picking up a serious knee injury in the game at Carlisle which clinched the promotion – a game in which he had opened the scoring. The injury proved to be extremely serious and the Carlisle game proved to be his last in a Diamonds shirt. While trying to resurrect his playing career, he had short spells at Bishop Stortford and Torquay United in August 2004, before playing a handful of games for Leyton Orient and Cambridge United. In February 2005, he came back to Nene Park for a trial, but his full time career was over. 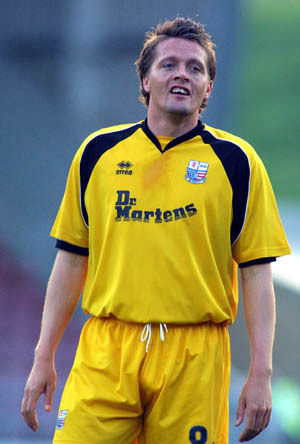 He played for Saffron Walden Town and Bedford Town after his trial, but was forced to retire in May 2005. He reportedly played a few games for Debden in September 2008. During early August 2009, Stuart signed a short term deal with Ridgeons Eastern Counties Premier League side Haverhill Rovers, but was still with the side for the 2011-12 season. On 13 June 2012, Stuart was appointed player/coach at newly formed Eastern Counties League side Saffron Walden Town, after the club had had to resign from that League 12 months earlier due to financial difficulties. In November 2012, he was appointed Joint Manager, with Colin Wallington. He took over full control in 2014, and remained in charge until September 2018. His Wikipedia page is here.